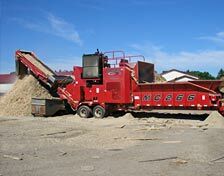 Since 2001, Quality Mulch has spent over $2,000,000 on state of the art grinding and colorizing systems to ensure the product that we produce is the best around. We grind our mulch into smaller particles than our competitors. This finer grind allows our mulch to act as a weed barrier. We only use clean, recyclable industrial lumber, pallets, pallet cutoffs and wood crating material. We don’t use construction and demolition material. Our colorant is the finest in the industry and will not harm your plants, trees or shrubs. It is safe for your pets and safe for the environment. Quality Mulch is strictly a wholesaler. 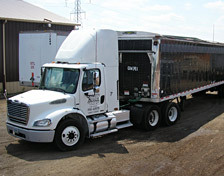 Our minimum delivery size is 100 cubic yards. Our fleet of 5 semi tractors and 5 walking floor trailers ensures timely delivery of our product. Has your current supplier called you during the summer mulch season and told you they have run out of mulch? Don’t let this happen to you again. 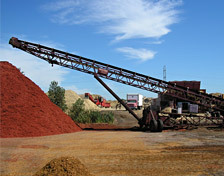 Our large inventory of colored mulch will ensure that your mulch season will continue uninterrupted. We pride ourselves on our ability to deliver a quality product to you on a timely basis throughout the entire mulch season. Just ask around and you will find that with us, THE DIFFERENCE IS QUALITY!